López Obrador has won Mexico but its political system is flawed as is most parliamentary type systems. It allows for coalitions to be formed from very different parties. The French have a run off with the two highest winning candidates thus forcing the people to choose between the two. The problem with the Mexico election lies in the promises. The people were fed up with the corruption and they just wanted to throw out whoever is in power. However, Obrador is more like Bernie Sanders. There is NO POSSIBLE means available to him to pay for his ambitious slate of social programs. He will raise taxes dramatically and we will see Mexico spiral downward into 2020. He is illprepared to get rid the government of corruption when the bureacracy is the problem. 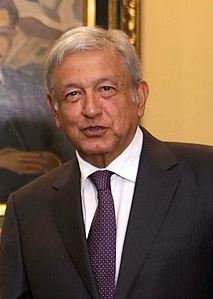 In fact, many who were deeply involved in the corruption saw the shifting trends and were a part of Obrador’s campaign. It is also not likely that he will make a dent in the unyielding violence of the drug war. The people are fed up with the drug wars which has escalated out of control. There were more homicides last year in Mexico than any time in the last two decades. The US dollar is still poised to rise against the Peso in the years ahead.